FEDERAL funding for the final stage of the Three Capes Track is still up in the air – two months before the walk opens. The track, which in January was labelled one of the “World’s hottest new travel experiences for 2015” by travel bible Lonely Planet, is set to open in December. But the original full vision of the track, which includes a loop out to Cape Raoul, is yet to be realised, leaving the State Government with a version once labelled the two capes trail by then Opposition leader Will Hodgman. Parks Minister Matthew Groom has told the Mercury the Government is “currently finalising detailed planning and design for the third stage and expect to make the final design public before December”. The State Government has committed $4 million for the final stage of the project. But Mr Groom and new Federal Tourism Minister Senator Richard Colbeck have acknowledged Federal funding of $4 million is yet to be secured. “The Tasmanian Government continues to have ongoing discussions with the Federal Government around funding for the third cape,” Mr Groom said. The Mercury asked Senator Colbeck and Trade and Investment Minister Andrew Robb if the federal funding was guaranteed. In a statement, Senator Colbeck did not guarantee the funds but did say “constructive discussions” were taking place. “The Federal Government understands that advanced planning is under way in relation to finalising the design for this stage of the project,” he said. In October 2012, the then Labor-Green government confirmed the project had blown out $7 million to $40 million, raising concerns the entire project would never be completed. The Opposition leader, Will Hodgman, said the project was at risk of becoming the two capes trail because of the then government’s incompetence. 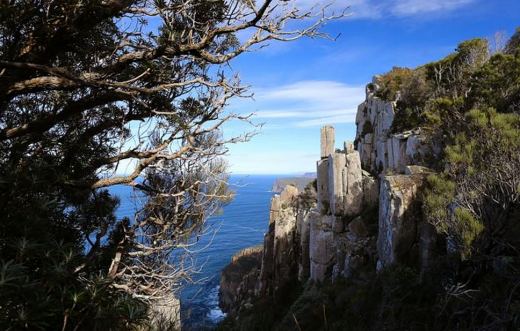 In January a spokesman for then federal Tourism Minister Andrew Robb indicated any money for the project may come from a $4.5 million regional tourism fund that was established under the Tasmanian Forest Agreement to revitalise regional tourism areas. But there were no promises.